Local supporters of captured Blaine County soldier Sgt. Bowe Bergdahl, as well as a few tourists, signed a birthday card Wednesday in Ketchum to give to the Bergdahl family. Bergdahl was born March 28, 1986. He was taken captive by Taliban militants on June 30, 2009, in the Paktika Province of Afghanistan. Candy Funk, co-owner of Despo’s Mexican restaurant in Ketchum, initiated the birthday card project after noticing on Facebook that his birthday was on Thursday. 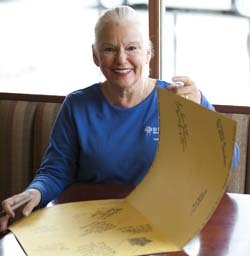 Despo’s was filled with spring break visitors to the Wood River Valley, some of whom signed the card. The card was dropped off at Zaney’s Cafe on River Street in Hailey on Thursday morning, from where it was delivered to the Bergdahl family west of town in Croy Canyon. Bowe Bergdahl worked at Zaney’s as a barista prior to joining the military. Zaney’s has been collecting birthday cards to give to him when he returns to the valley. Hailey resident Debbie O’Neill said she plans to plant four trees in Bergdahl’s honor on June 22, one tree for every year he has been in captivity. Her efforts are organized through Facebook. “We pray that they will not have to plant a fifth one next year,” she said in a written statement on Facebook. The event will take place at Hop Porter Park in Hailey, with live music and food. To RSVP to the event or find more information, contact Debyoneill@aol.com or on Facebook at www.facebook.com/events/141029086071390/?ref=3. Marsano said he spoke to the Bergdahl family last week and they did not indicate that they have any statements for the media. “They very much appreciate the many displays of support they see each day in the Wood River Valley,” he said.